When a person is actively searching for a job, and is unable to find any work this is called unemployment. It can also be defined as a situation where someone of working age is unable to find a job but who would like to be in full time employment. Unemployment is often used as a measure of the health of the economy of a nation. The most frequently cited measure of unemployment is the unemployment rate. This is the number of unemployed persons divided by the number of people in the labor force, If a mother left work to bring up a child or if someone went into higher education, they are not working but would not be classed as unemployed as they are not actively seeking employment. Work organizes life and it gives structure and discipline to life. Scientific research findings show that unemployment can affect an individual’s psychological well-being and it can leave tremendously powerful scars on a person’s psyche. Unemployment can leave some individuals with feelings of worthlessness, lack of motivation, feelings of embarrassment, greater level of anxiety, hopelessness and increased levels of stress. The worst adverse effect of unemployment is that a person who is unemployed has a very hard time getting hired. Companies usually hire people who already have jobs as people with jobs usually socialize in similar places and referrals increase their chances of getting new jobs. This really adds to the disappointment of unemployed people. Crime rates rise as people are unable to meet their needs and divorce rates often rise because people cannot solve their financial problems. In some cases because of the unemployment the youth delay their marriage age which is also a prominent social problem. Unemployment is associated with elevated rates of mental and physical health problems. It increases morbidity and mortality rates, and can cause detrimental changes in family relationships and in the psychological well-being of families. Scientific studies have already pointed out that unemployment can contribute to increased rates of suicide and reduced life expectancy. Unemployment is a greater motivator to illegal and unauthorized means to receive benefits. Unemployment has a positive effect on the rise of violence and economic instability in Afghanistan.Most Afghansbelieve that unemployment is the main cause of continuous insurgency in the country. There are many examples that young unemployed Afghans joined the anti government armed groups; In fact, they are not joining the extremists or insurgents to follow their ideology, and sometimes they are against their ideology but they joined them to earn money to buy a loaf of bread for themselves and for their families. It is a clear fact that the killing of insurgents has not weaken the insurgent forces and they seems to be more stronger and the major reason can be the high rate of unemployment in country, which leads more of our unemployed youths to join the anti -government insurgent groups. Unemployed teens are used as suicide attackers, battle forces, or laborers for implanting Improvised Explosive Devices (IED) and in some provinces unemployment has also led people to grow opium, poppy, and others are encouraged to join the extremist groups. In short, no national strategy will succeed unless create millions of more jobs! Imprisonment of poverty criminals is not a real solution to solve the problem of crime; it does nothing for the victims of crime, but perpetuates the idea of retribution, thus maintaining the endless cycle of violence in our culture. It is a cruel and useless substitute for the elimination of those conditions--poverty, unemployment, homelessness, desperation, racism, greed--which are at the root of most punished crime. The crimes of the rich and powerful go mostly unpunished. Afghanistan comes in the list of top countries with highest unemployment where the unemployment rate is estimated 50% - 60%. 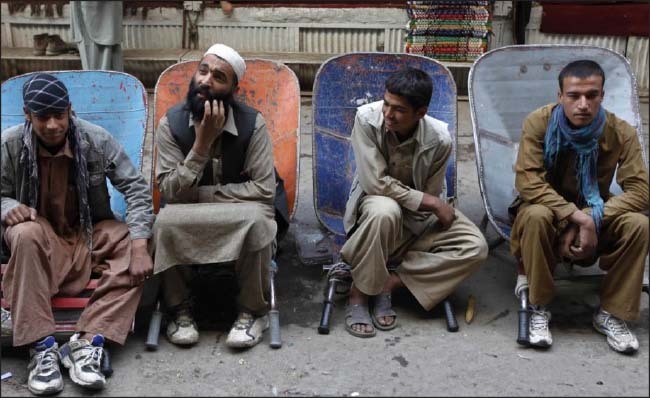 Unemployment and social difficulties increases the number of drug addicts, the number of drug users in Afghanistan is estimated to be as high as 2 million, among the highest rates in the world. The further depth of unemployment problem can be calculated by recent report of World Food Program (WFP) revealed about 40% of Afghan people facing food shortage comprising 11.3 million residents and forty percent children of chronic malnourishments. The Afghan National United Government has not been able to optimally exploit the resources and create jobs as promised. On the other hand, there is no part of the country which somehow not influenced by terrorists. It means that terrorist groups has not only threatened the economic arteries of the country but also disheartened economic investment in the country. In economics, hope and faith coexist with great scientific pretension and also a deep desire for respectability which has entirely disappeared. The only solution to unemployment lies in active support of private sectors, and paves the way for multi-lateral national and international trades to create jobs and ensure economic stability. The easier to run businesses, the easier to create more jobs in a functioning economy: let’s simplify the process of registering new startups and international companies in Afghanistan. let’s first invest in secure provinces. The old irrational practice has to be transformed into an efficient, technological and business friendly process that takes hours rather than days. Entrepreneurs and private sectors can create jobs and transition Afghanistan from aid dependency into self-sustainability. The government has to make doing business easy, support the private sector and not try to do business. The governments of the world are not good at doing business and should stay out. The Afghan government must ensure security, fight internal corruption and remove the barriers for private sector to deliver real value and change.